CIVIC-TECH : Case studies tools and platforms for civic engagement. CIVIC-TECH : 100 Case studies tools and platforms for civic engagement. The following datas are therefore from a sample, so less reliable than could be a complete observation, but which allows us to identify certain trends in 2019 Civic-Tech Market. We actually have just finished the “Great National Debate” in France, wich as been the answer of our government to the social activist movement of the “Gilets Jaunes” raised on the web before moving to the French streets. People around the world are more and more friendly with social networks and digital tools to inform and organize themselves on policy news, social movements and civic issues. I was wondering on what kind of web-based services could help local communities to get a better catch on their neighborhood planning and started to have a look on civic-tech providers. They seemed to be growing fast but it was hard to find concrete analyse of this market, their leaders and background strategies used by them to change the old-school political game. 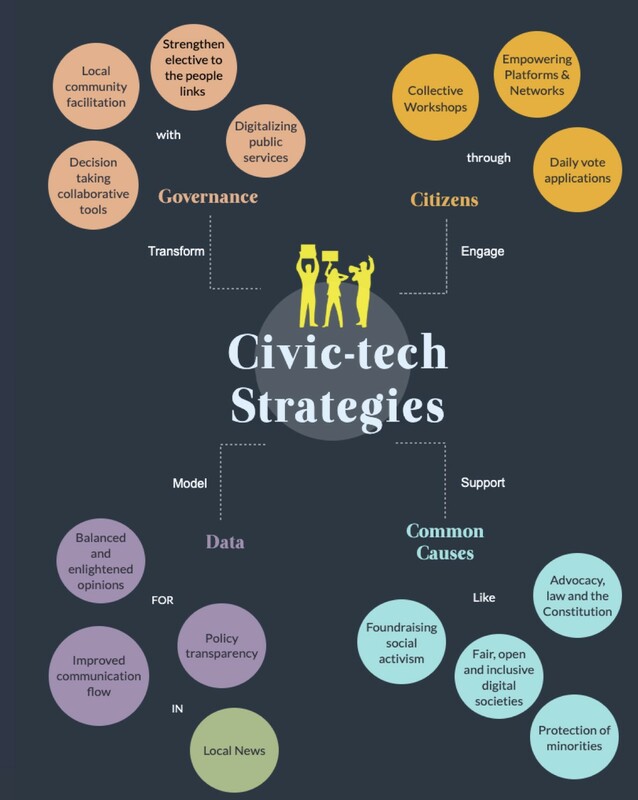 So I decided to conduct this study on Civic-Tech and publish my results to give potential users, tech developers and local governments a better view on who is doing what actually on civic engagement through technology, and where in the world ? I picked up approximately 400 civic-tech providers’ names on civictechno.fr (french repertory of civic-tech providers) angelist.co (US repertory of startups) and linkedin.com (worldwide social network for professionals). I contacted them by email to ask if they wanted to participate a case study on civic-tech. I finally collected precisely 100 participants to my study with peer-to-peer calls and survey answering. 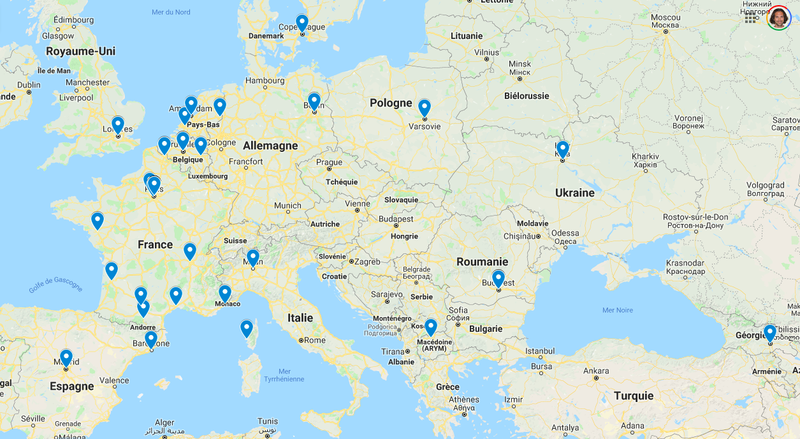 Most of them are based in EU and USA, what is maybe significant for Civic-Tech and Digital Democracy market, but needs to be taken with caution because I used French and USA based directories. 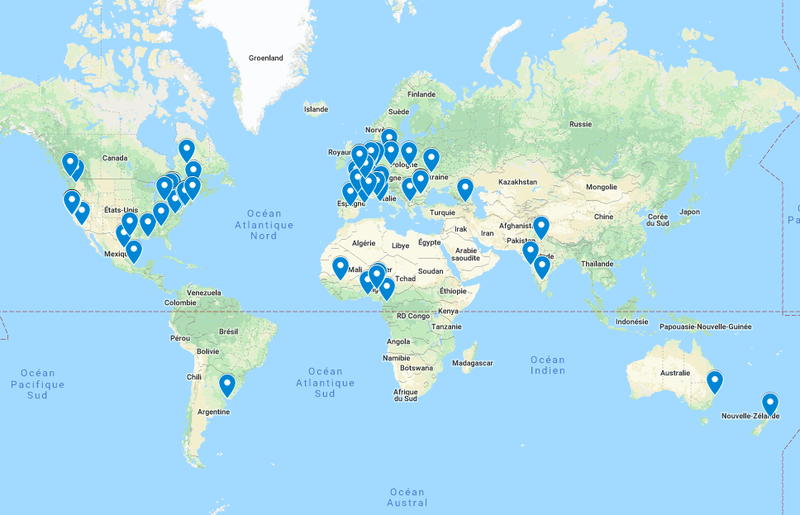 Despite this skew process due to a lack of information at my disposal on Asia, Africa, Latin America and Russia potential civic-tech developers, I had some interesting contacts in Uruguay, Nigeria, Mali, Cameroun, Georgia, India, New Zealand and Australia. 1. Founders’ Profiles: Who is developing Civic-Tech? The average age of the founder or main representative is 33 years old, and the median age is 32 (this means 50% of the founders are more than 32 and 50% of the founders are less than 32). Since the average and median age are almost similar, we can call this distribution “symmetrical”. About their background career or studies, Engineering is the most widespread way, then we have Business Schools or Business Administration, Computer and Political Sciences at a similar rate. Software Development, Managers, Entrepreneurs and Designers are the least represented. As it as already been confirmed by political researchers (I’m thinking about Clement Mabi but I can’t find the precise reference now) the people who engage politically online tends to be the same that those who are or have been involved on politics offline. This result confirms a hypothesis: Most of the founders of Civic-Tech where already involved in civic engagement, activism or political party. Were your founder already involved in civic engagement, activism or political party ? 2. What about their Organisations? 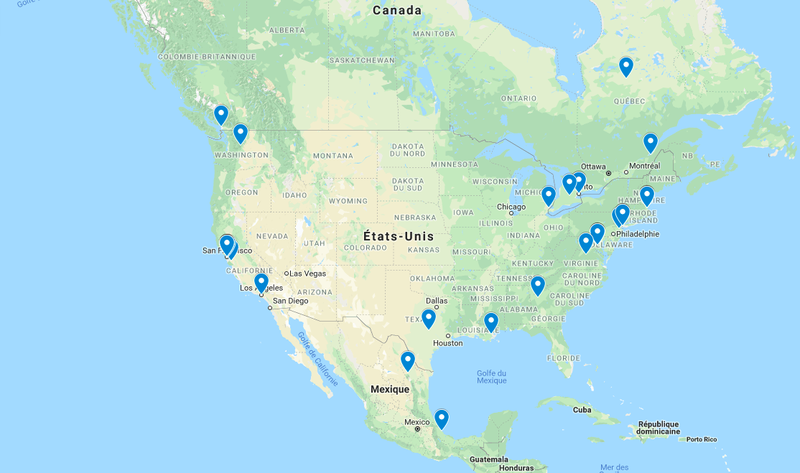 City based: I already told why, but good to notice that 12 on 100 of my respondents are based in Paris, 5 in San Francisco and 4 in Washington DC. Then 3 in Brussels, 3 in Boston, 3 in Bucharest and 3 in New York City. The rest is distributed around the world with a high concentration in Europe and United States of America. Date of creation: About 50% of them were created the last three years, and only 25% of them have more than 5 years of existence. So we can confirm another common hypothesis who says that Civic-Tech is a young market. The bad news about it is that it’s still unstable and unregulated but the good news is that it will continue evolving and innovate for the years to come. 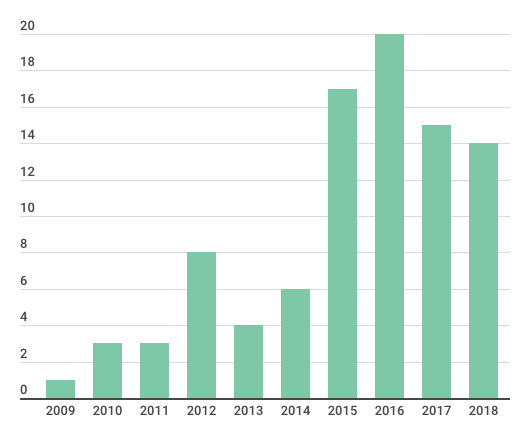 Numbers of civic-tech organisations created year-per-year from 2009. Workforce: To evaluate the size and workforce of each organisations, I’m combining three important characteristics : how many people working, full-time or part-time, employees or volunteers ? We can easily assume the principle, confirmed with the results, that full-time workforces are paid for their work. Full-time employees are 45% of the organisations involved in this study. It sounds like a good economic health status indicator ! 34% of the part-time workers are a majority of volunteers, but also some contractors, interns and associates. If the big majority of 1 to 10 people staff are salaried to deliver long-term solutions instead of prompt answers, there are also twice more salaried workforces than voluntary ones in 10 to 50 staff teams. Anyway, we would see above that volunteer engagement seems to be a critical issue for some organisation’ sustainability. Finally only 20% of the workforces deployed are a mix between full-time, part-time, employees and volunteers. 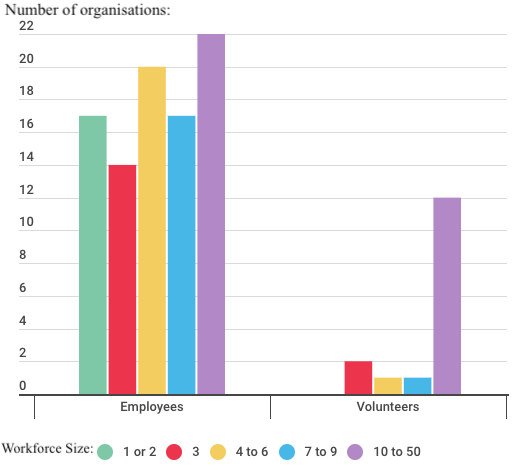 Comparative distribution of organizations by workforce size, employee / volunteer. Marginally Code For All organisation claims 25,000 volunteers involved through 230 local communities around the world. Code for Romania is part of them and declared 600 volunteers for its only community. I haven’t entered those two values otherwise I would have crashed the entire graph. => Code for All appears more like a meta-organisation, who supports community based local initiatives around the world. They are pretty famous in Civic-Tech market and I will devote them a more in-depth study in a few months. 3. Frame of reference: How do they define themselves ? At the question “How do you recognize yourself in the term Civic-Tech ?“ the respondents were able to give a graduate answer from 1: 100% Civic-Tech to 5: I don’t like this term. The results let us know that +70% of them feels very close to Civic-Tech term. In practice I may presume that “Civic-Tech” word probably emerged from those who are doing it, so this result do not says a lot except that I have well targeted my sample population. Let’s look instead at what the 15% who do not recognize in “civic-tech” term say: we can find one artist, one advocate, one activist, three authenticated and legitimate positions to work on civic engagement with tech without self-defining like a civic-tech. But the others are all turning around the word without saying it, so I guess they will finally adopt it too. The next question “How would you define Citizen Consultation” is a little bit more risky to evaluate, but I was thinking to the Political Science researchers like Loic Blondiaux who makes a big difference between citizen consultancy methods based on aggregation processes and those based on deliberative processes. The respondents could position themselves on a scale from 1 to 5, where 1 corresponded to “Statistical aggregation of individual interest” and 5 corresponded to “Confronting points of view leading to a choice”. Is it sincere or did they felt the trap? The fact is nobody has responded “Aggregation of individual interests”, which should reassure the most critical about bid-data and algorithms based governances. The question “What is your vision for public services” is more political: it’s about how Civic-Tech actors represent themselves the relationship between the state and the citizens. The graduated answer from 1 to 5 proposed 1: Necessarily from a government to citizens and 5: Could be delivered from private sector to citizens. Here again, we are not in front of ultra-liberal libertarians to whom it would delay to suppress the state and the aging institutions of power. Indeed the modal value is a balance between Gov to Citizens and Business to Citizens services, and the distribution is clearly asymmetric to the left, which means that Civic-Tech developers are still attached to the concept of the state and somehow to centralized governance. How do they perceive their impact ? +80% of them feels like already having an impact on public services and +77% would say they participate to increase a local government efficiency (lower spending or lower ressource consumption). In peer-to-peer call interviews, the answers was more subtle: real impact is hard to measure, and they are aware of sometimes representing an over-cost in the short-term but think they can help streamline spendings or give a better service with the same budget in the middle/long-term. Some other specify that they are facilitating information flow between elective and people, fighting against fake-news, web obscurantism and abstention at elections. 1. Strategies: How are they entering their market ? As a result of this study, there seemed to be four ways to tackle with civic engagement issues. About 31 % provide services to governments, candidates on elections, professional intermediates and community leaders. They talk for the most about digitalizing governments and equip team organizers with more efficient tools. 27 % focus on citizen’s autonomy in taking decisions and direct democracy empowerment tools, like daily vote application, some of them with secured ID validation process. 22 % work on data collect, analyse and visualization to bring a better-understanding information to the people, help individuals to get a more knowledgeable opinion and tends to go on real-time transparent policies, using both printed press and digital. And 20 % is above all supporting common goods, social causes and development initiatives in the most vulnerable communities. 2. Successful implementation: is there any underlying magic feature ? It’s now time to answer the vibrant question that every project manager is asking: is there any chance to get effective results according to functionality choices ? I would say NO. At any rate, I haven’t be able to found, in my datas, no evident correlation between the presence or the absence of certain functionalities and success in adoption by users. Furthermore, if the relationship between feature choices and implementation success is a legitimate theoretical question, interpretation of results can only be used with utmost caution, not to be confused with coïncidence and concordance. It’s clear that civic engagement is first of all a human management issue and humans do not seems to react as precisely as computers to programming. Then because success is an objective assessment, I have proceeded to a discretization on success results, to distinguish three categories: Successful, not sure yet, Unsuccessful. 66 % claims success performance on at least one civic engagement action, 20 % in early stage or beta-testing don’t really know actually and 13 % feel the pinch of the uphill task to wake up democracy. So despite the lack of precise rules to adopt in civic-tech strategies leading to success, 2 on 3 respondents are pleased with their work, and it’s the prime indicator to predict that they will continue to do it. Something that seems useful to specify here, is that success looks totally uncorrelated with workforce size because I find equivalent proportions of single developer and bigger teams in each category. Another interesting statistic in my opinion is the composition of ownership : Is the organization owned by founders or main representative ? Do they share ownership with external investors? Did they get subsidies from public sector or are they supporting their own work with customer sales? Good surprise is that 1 on 3 respondents is financing his own business with customer sales only, no subsidies, no external investors. Then 10% each for those who get external investors, subsidies or not, but get money income from their clients. And 7% for those who have received a public subsidy but no external investors and now balancing with customer sales. The less represented subjects are those who get subsidy but no clients: 3,5% with or without external investors. This last result is reassuring regarding public spending. On another note, 10% of respondents would probably struggle soon with shareholders because they have no customers and no subsidies but external investors, and even more worrying 23% of respondents say they have no customers, no external investors and no subsidies. At least, let’s wish them Godspeed ! 3. Pain points and explicit needs. I finished the survey with a foresight exercice to know what could be the worst and the best scenario happening to them. The reward for the worst scenario is definitely dedicated to the one who said “To die before delivering my artwork to the world”, a truly subject that concerns us all. Two of them also referred to the best situation, enemy of good, where they could crash for having too much users. But the most representative fears come from disinterest of the public, the government or the partners (27%) and not selling enough, no more philanthropist or lower public budget (25%). The anxiety of not finding the good product or not being useful is present too (12%) as far as major political changes (10%). Data closeness and opacity in governance (7%), being hacked, stolen, censured or crushed by the GAFAM (7%). At the opposite, as best thing that could happen to their organisation, 22% would struck a great deal with public sector. 17% expect for more users, 12% would attend founds availability, 10% hope for a deep society change and 8% plan to have a monopoly on their solution. Technology advent and standard use are 5% each. To achieve this ideal scenario, they would need a better communication (17%) and stronger trust in their solutions (15%), more investments (14%) and more sales (12%). An extended network (8%) to get support from government and representatives in public sector (12%) and strong partnership with industry or bigger companies (8%). A more knowledgeable and powerful workforce would also be welcome (10%). Finally we can say that Civic-Tech is a young market conducted by young educated leaders, sensitized to political issues. Based in democratic countries, they often hire employees to drive the social and digital transformation of politics. They do not seem to be keen on ultra-automatisation, bots and algorithm-driven decision-taking processes on society. Quite the contrary, they are committed to human being sensitiveness and the concept of local government. Porism, N55, Digitalebox, Babele, Tesz, Digital Peace Talks, Lobby Citoyen, Civinaut, Reap Benefit, We Are Peers, Politizr, AgoraLab, HousingNowTO, Argo Labs, Voxmapp, Mesydel, My Open City, Code for New Orleans, Organize Together, Involved, iD City, Le Drenche, Act, Bloom, Code For NL, Cap Collectif, Civic Studio, Université de Cergy Pontoise, Assemblée des communs, Démocratie Libre, i-Buycott, City Zen Map, Civic Hall Toronto, Inseme, Code for San Jose, Civis Vote, Citizenlab, Civocracy, CivicTech WR, Civic Data Lab, Citizen Clan, Eduplana, Uyolo, Bouge ma ville, Ciudali app, Civica Digital, Geo Cameroun, My Mairie, Impetus, Connected Development, Canvis app, Asylum Connect, Civix, ePaństwo Foundation, 5 Calls, Loomio, Code for All, Open Source Politics, Ilda, Le Vote, MetroLab Network, The Tuesday Company, Smart Cville, Just Fix NYC, Youth UpRising, ePluribus, Austin Tech Alliance, AnimaCité, Co-Labs, Populate, Code for Romania, The Social Coin, Quorum, Collecticity, Tuwindi Foundation, Civic Signal, Converlens, Exygy, CivicTech Romania, Our Society, Maires et Citoyens, Citiesense, Ride Along, Social Boost, Place Speak, Vooter, People Movers, Politiker, Communecter, Demokranti, TransparencIT, Women Veteran Social Justice, Tapvote, Noble Missions, Citizen’s Cafe, Agree App, Assembl, Politik.ch . Julien Carbonnell: After some years like Real Estate Developer in Perpignan, South of France, I experimented different ways to implicate inhabitants in taking decisions on urban-planning with my startup OpenPI. I’m actually having a PhD research on “Civic Engagement in Smart-Cities” from the urban research laboratory MRTE of the University of Cergy-Pontoise, Paris, France.